For introductory computing and programming courses at four-year and community colleges. This new text uses Alice and Media Computation to introduce students to the #1 programming language in use today. 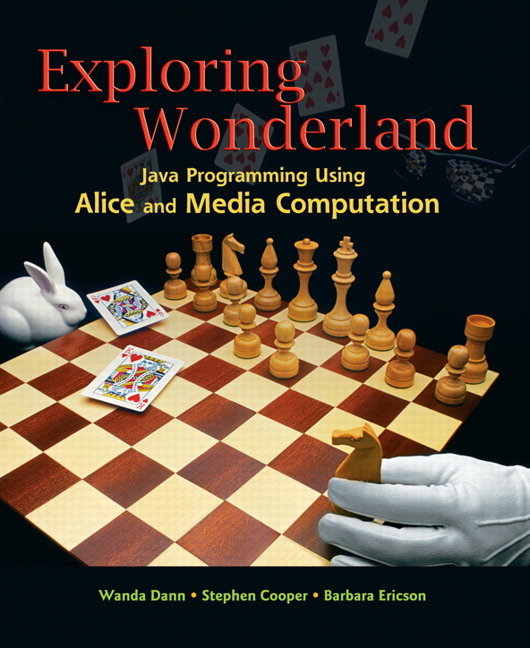 Exploring Wonderland: Java Programming Using Alice and Media Computation, uses Alice to introduce the fundamental concepts of programming, thereby decreasing early frustration with syntax errors usually encountered in a text editor. The concepts introduced in Alice are then applied in Java using Media Computation examples (working with sound samples and pictures). This approach is highly motivating to students, especially for those without prior programming experience. A unique approach and a high-impact, motivating context for learning: Instructors who teach Alice have shared with us their concerns about how to transition students from Alice to programming in Java. This book’s unique combined approach motivates beginners to learn computing concepts in Alice and then see how to implement them in Java using Media Computation. First the authors show students how to program in Alice by dragging and dropping tiles to create 3D movies and/or games. Then, in Media Computation, students learn to program by writing textual programs that manipulate media: pictures, sounds, movies, and text. Mediated transfer : The authors' experience is that students “get” the concept by seeing very similar examples presented “side by side” in Alice and then in Java and by the instructor making an effort to emphasize the similarities and explain the differences. Mediated transfer between Alice and Media Computation in Java is the underlying approach of this text and instructional materials. The Tea Party website , maintained by Barb Ericson, provides some support to assist teachers in making the transition. Widespread Appeal: By blending Alice with Media Computation the authors take advantage of the interest and motivation students find in video games and animated films. They believe that this approach will appeal to a wide range of students while covering all the same skills and concepts mandated by curriculum standards. Highly Accessible: Alice has a wide, established audience in colleges and universities in courses for non-majors. 16-2 What makes programs fast? 16-3 What makes a computer fast? Dr. Wanda Dann recently accepted the Directorship of the Alice Research Project at Carnegie Mellon University. She has been an active member of the Alice team for the last decade. Wanda's research interests include visualization in programming and programming languages and innovative approaches to introductory programming. She has published multiple papers on the use of program visualization in programming languages and its use in teaching and learning introductory computer programming. Dann’s papers and articles have appeared in ACM's Special Interest Group on Computer Science Education (SIGCSE) Inroads , the Computer Science Education Journal, and other related publications. Dr. Dann is the lead author of Learning to Program with Alice (2006, Prentice-Hall) and Learning to Program with Alice , Brief Edition (2007, Prentice Hall). She is also a distinguished contributor to professional Computer Science educator groups and has served as ACM’s SIGCSE Technical Symposium publications editor and as ACM’s SIGCSE Symposium chair. She was recently elected to serve as a member of the SIGCSE Board and is the SIGCSE-CSTA liaison. Dr. Dann received a Ph.D. in Computer Science at Syracuse University. Stephen Cooper is an Associate Professor of Computer Science and the Director for the Center for Visualization at Saint Joseph's University. He taught previously at Rivier College, serving as Computer Science program director. He has also worked at IBM as a systems programmer. Dr. Cooper's research interests lie in the semantics of programming languages as well as in program visualization. He is the author or co-author of a dozen articles, and has been the principal investigator for several National Science Foundation and private grants. Barbara Ericson is a research scientist and the Director of Computing Outreach for the College of Computing at Georgia Tech. She has been working on improving introductory computing education for over 5 years. She is currently the teacher education representative on the Computer Science Teachers Association board and the co-chair of the K-12 Alliance for the National Center for Women in Information Technology. She enjoys the diversity of the types of problems she has worked on over the years in computing including computer graphics, artificial intelligence, medicine, and object-oriented programming.